Here's the thing. The answer to both is the exact same. 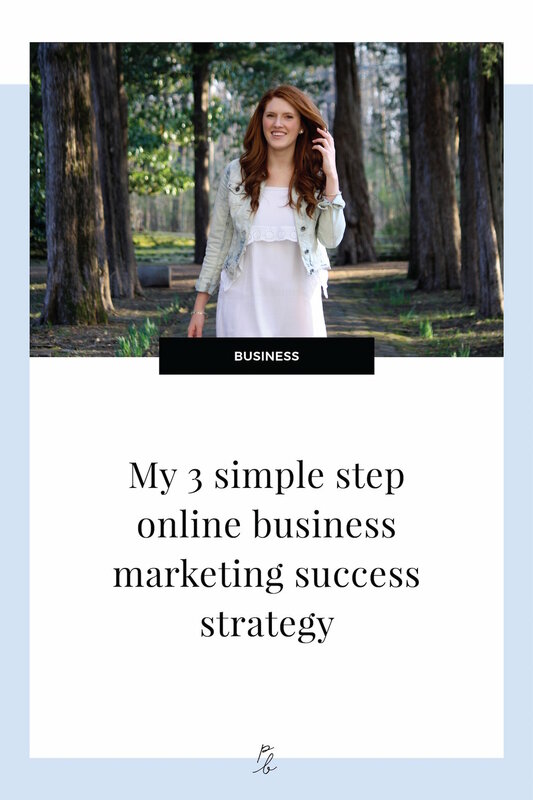 I have a 3 step, yes - legit - it's just 3 steps, marketing system. Let's be honest, and maybe you can relate to this, as a one-woman show, some complicated and time-sucking marketing strategies just won't work. So I devised a marketing strategy that actually works for me, my time and my lifestyle. It books out my design spots and sells the seats to my courses. I know that there are a zillion of y'all out there currently testing all the marketing strategies, hoping something sticks and getting frusterated in the process. So I thought I'd share what I'm doing, because after being consistent with this one simple strategy for a year and a half now, I can say with confidence that it works. Before we go even one step further, I should mention that yes, I totally get it and I had the exact same questions back in the day. I was clueless as to how on earth others landed ideal clients and sold out seats to courses and made consistent income selling digital products online. I learned one thing in my trial and error of all the marketing strategies. Trying posting in Facebook groups on Monday, blogging on Tuesday, podcasting on Wednesday, growing your Instagram on Thursday and generally having a meltdown that nothing feels like it's working on Friday is a recipe for failure. As one person, we cannot be experts at all the marketing strategies while running our businesses. My business became successful because I picked one strategy and stuck to it. The key to gaining momentum is to pick something and work at it day in and day out and not keep changing focus constantly. Okay, let's get straight into the 3 steps, shall we? Your mom will go to your website because it's your website and she wants to support you. The rest of the world? No chance! People will come to your website and bring you traffic in droves when you provide valuable content. Why are you on this website right now? Because you think I'm fab and just like hanging out here? No. You're here because I'm promising to help you through this post with your marketing. Why else would you be here? So why will people really visit your site? Because you help solve problems. Because you help educate visitors on a specific topic. Because you give free, quality content and information away. That's how you get people to your website! Blogs. Podcasts. Videos. Infographics. Challenges. Courses. That type of thing. Those are all just formats of content. The format you choose really doesn't matter all too much, the thing that does matter is that you frame your content in a way that it's helpful to others. I always give the same example for this one. Say you took a trip to Paris. How lovely! Then you write a blog post titled 'My day in Paris.' Who's going to read that blog post? Your mom and no one else. Why? Because it's not useful or valuable to anyone else. Now, say you wrapped up your trip to Paris and then wrote up '10 most Instagramable cafes in Paris' or a 'Weekend guide to Paris for couples' posts. Create content that adds value to people's lives and they will come to your website. Now, there's one vital piece we haven't covered here. You need to create content that relates to your niche. I met a girl in Bali who wanted to be a videographer for travel destinations. So she started a daily vlog showcasing her adventure travels and backpacking around Asia. Daily vlogging is no joke, it's a massive amount of work, but she got NO business from it and was in a bit of a crisis as money was getting tight. So what was the problem? She was pouring all of her time and effort into her daily vlog which then attracted people who wanted to backpack around Asia and people interested in adventure travel. She needed to attract the attention of travel business owners and tourism destination boards. But she was creating the wrong content. If you want to attract people who own a hotel in Hawaii to hire you to film their place, you create content that helps those business owners, not content that helps people backpack around Asia. While yes, her content was in the realm of video and travel, it was still off the mark in terms of getting the exact type of people she needed to hire her onto her website. Good question. Someone emailed me that one and I wrote this post to answer it. If you're wondering the same thing, be sure to go give it a read. Alright, so now you have traffic to your website ... how do you get people to buy stuff from you so you can turn that 'hobby-website' into a 'I-make-more-than-a-full-time-living-online-website'? You get their info so you can keep in touch. People rarely buy something online after hitting someone's website for the first time. In fact, that happens almost never. You've gotta build that relationship next! How do you do that? Let me ask you a question? On a scale of 1-10 how much do you hate your inbox? For me, it's a 10. I get SO many emails and honestly I want less, not more of them. If I'm going to join an email list, there's gotta be a darn good reason for it. And some website kindly asking me to 'subscribe to our newsletter' definitely doesn't qualify as value-adding to my life. Now, you wanna give me '10 essential email scripts you need as a creative business owner?' Sign me up! '10% off my next order?' I love saving money, it's means more for my margarita fund! Again, just like the content creation, your opt-in gift needs to truly help and be valuable for your potential buyer. Get inside your ideal clients head (metaphorically not surgically) and determine what exactly would help them right where they are right now. You help new brides create beautiful invites to their wedding? Before they go to buy they might be wondering what exactly etiquette dictates about invites, so that would be a killer workbook to put together and give away in exchange for their email. In terms of where to put your opt-in gift on your site, don't be shy, use a pop-up, put it in blog posts, drop it in the footer of each page and ensure it's front and center on your home page. When you have valuable content alongside a valuable opt-in gift that's a perfect fit, something your ideal clients and customers really want, the email list will grow itself, just let time and site traffic do the work for you. Now, this honestly deserves it's own full post so I can really get into this topic more in-depth, but here's the short and sweet version. When it comes to selling high priced services, I've found I've had the most success by getting people to book free consultation calls with me. Saying in an email 'buy now, hit reply to book your site design date' didn't work so well. So what exactly do you say in your emails? Here's an example. "Want to spend your time working in your business and not on your website? So over fiddling around in Squarespace yourself when you just know there's someone out there that could do it 10x better and faster for you? I have just a couple spaces a year where I work one on one with clients to build them the site they've been dreaming of in their mind! Wanna see if we're a good fit? Schedule a free consultation call"
Email subscribers then book consultation calls and from there we chat, see if we're a good fit and start working together! Again, a key thing I've learned when it comes to selling services that are in the thousands of dollars is that there really needs to be a consultation and a one to one chat in order to answer questions and get prepared to book. So for selling high-priced services through email, go the free consultation route, you'll do a lot better that way. It's an easy first step towards working with you. When it comes to selling 'lower-priced' products, it's a bit different. (When I say lower-priced, that still could mean your item is a few hundred dollars, but probably not multiple thousands.) You definitely don't want to offer free consultations for your $10 e-book. Just like when someone hits your website once and doesn't buy, it's possible but still rather unlikely that someone will get one email from you mentioning a product and buy too. You've gotta warm 'em up to it. Really show the problem your product solves, and clearly show the road between where the person is now with their problem and what the transformation will look like once they've bought your thing. This generally takes a few emails, so you'll want to set up a whole sequence of emails that sort of flow well one into the next, painting a story and taking subscribers through everything they need to know and understand to be ready to buy. In my recent course launch, the importance of an email list was reaffirmed to me again. I was launching a course at the same time as some other business owners in Mariah Coz's Accelerator program. We all had the same guidance on building the course, creating a sales page, and marketing. One other Accelerator participant had almost 20,000 Instagram followers. Their Instagram content was straight up beautiful, I couldn't dream of creating a feed as amazing as theirs. Their course was hellah-valuable and was created exactly for the audience they had already built on Instagram. Everything fit and yet their sales were not what they hoped it would be. I had an email list a fraction of the size of their Instagram following and sold quite a few more seats in my course. I'm not saying this to talk about how great I am, I don't by any means want to say that my course was better or my sales page was better or that I in any way was better than them. In fact, it's not a competition of who can sell the most course seats at all. #communityovercompetition. I honestly think the reason I was able to make the sales I did was because I had already built an email list and email converts y'all. Every single Accelerator participant finished up their first course launch and decided 'I'm focusing on building my email list.' Every single one. And I hope that says something to you, because it definitely says something to me. If you have the time to build an Instagram following and an email list. Go wild. If you only have time to really kill it with one marketing strategy, make it your email list.